Now that we spend so much time in Italy, it seems a bit strange to imagine that the first place we ever visited in the country was Bolzano. As the capital of the South Tyrol region, Bolzano offers an incredible cultural mix of Italian and Germanic influences (you’ll still see some references to Bolzano as its German name, “Bozen”), delicious and varied food, beautiful architecture, and–the highlight–absolutely stupendous natural scenery. Surrounded by small mountain villages, seemingly endless vineyards, several castles, and of course the ever-impressive Italian Dolomites, Bolzano is an Italian city like no other. My grandparents first started visiting Bolzano many years ago, and at this point, Jeremy and I have visited several times, both with family and by ourselves. It may not be a typical destination on most Italy itineraries, especially for first-time visitors–but it’s definitely a city worth seeing. Looking for the best things to do in Bolzano? We’ve got them all covered here. Every city in Italy has a main piazza that you simply have to stop by–either on purpose or simply because it’s an unavoidable fact of life–and in Bolzano, that’s Piazza Walther. Bright and colorful, as well as steps away from Bolzano’s cathedral, Piazza Walther is both beautiful and, due to its central location, an excellent place to start working through your list of things to do in Bolzano. As far as Italian piazzas go, Piazza Walther is a quite modern one: it was built in the early 19th century. Admire the view from the Santa Maria Maddalena Church. Vineyards coat the landscape outside of Bolzano, creating one of my personal favorite views in the world (grapes + stone churches + rolling hills + snow-capped mountains in the background = an amazing sight), and there is no better place to admire the view than from the Santa Maria Maddalena Church. This tiny church isn’t open to the public more than a few hours a day, but its stone exterior, the incredible view from its property, and the nearby wine tasting room all make this tiny church a place worth visiting. 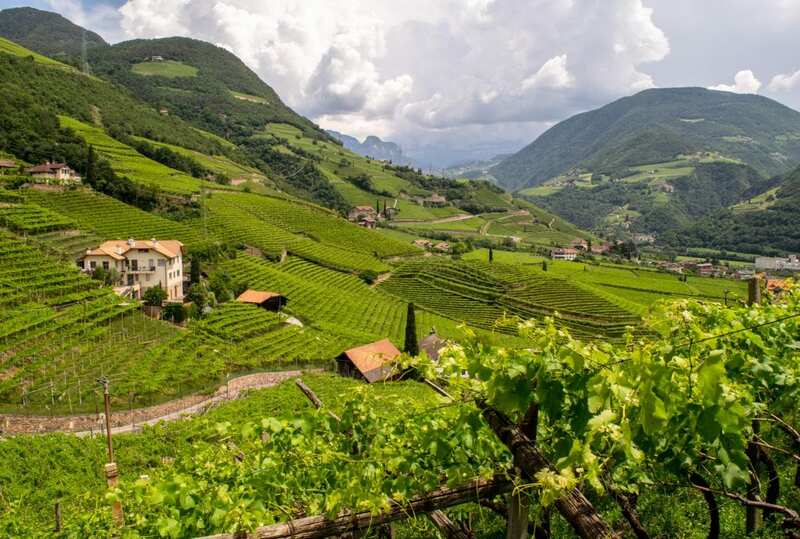 No matter how much we love Tuscany and Tuscan wine–which is a lot–the hard truth is that when it comes to scenic vineyards, South Tyrol has Tuscany beat by a long shot. … And not only are the vineyards gorgeous to look at, but the local wines are also delicious! Pay a visit to Bolzano’s castles. The area surrounding Bolzano is home to plenty of medieval castles, making it the perfect playground for history lovers and landscape lovers alike. 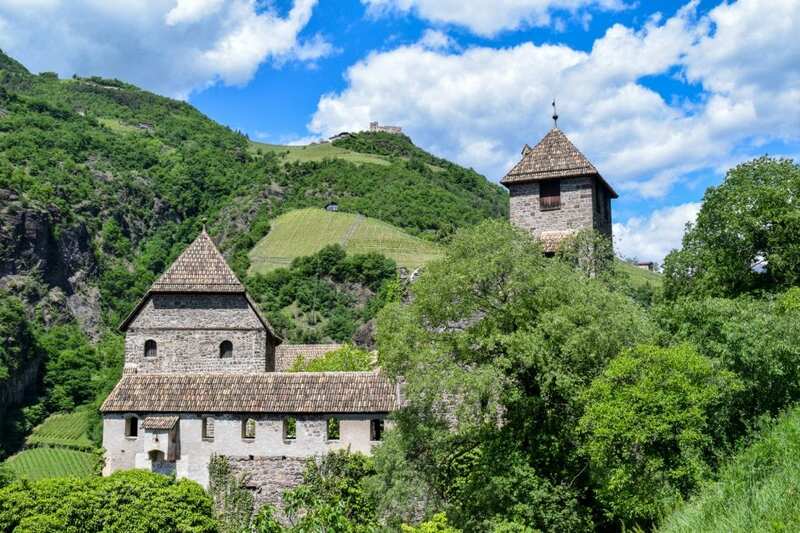 Castel Roncolo (aka Runkelstein Castle) is the easiest to reach from Bolzano and is known not only for its beauty but for its decidedly-not-PG secular frescoes. Castel Mareccio and Flavo Castle (which boasts a restaurant!) are also nearby and worth checking out, even if only from the outside. Say hello to the 5,000-year-old man. Around 5,000 years ago, a middle-aged merchant died in the snowy Alps. Around 30 years ago, he was found again–mostly intact. Ötzi, as he is now known (I prefer that nickname to “the Iceman”, anyway) has been intriguing scientists for decades. His DNA, blood cells, clothing, objects, and more have all been incredibly valuable in identifying who he might have been and what life might have been like in the region at that time. Today, you can visit Ötzi in Bolzano, along with many of the original artifacts found with him and information about many of the scientific discoveries made with his help. 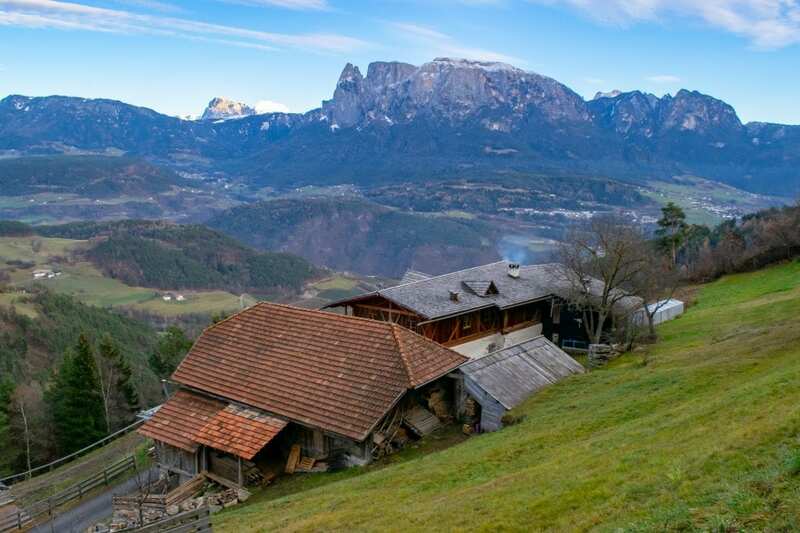 Without a doubt, a visit to Ötzi is among the most unique things to do in Bolzano! 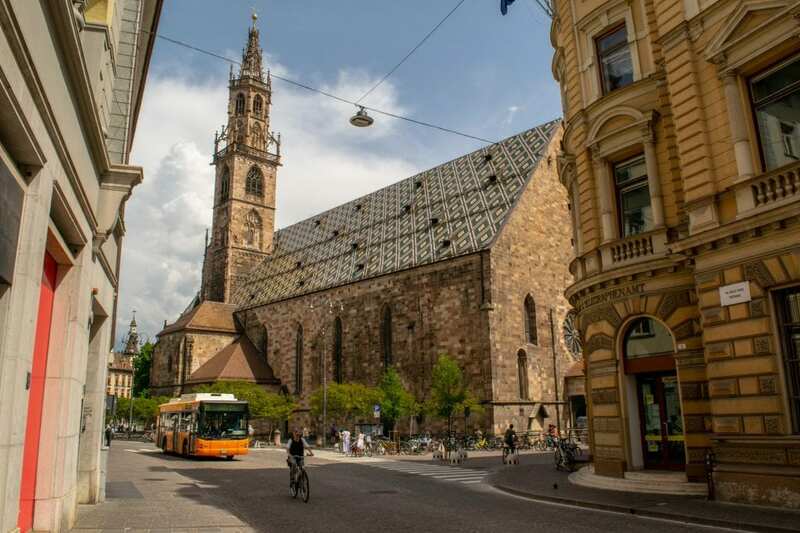 Bolzano’s main cathedral is beautiful and imposing in all of its Gothic splendor. When you step inside it today, it’s hard to believe that it was severely damaged by Allied bombings in 1943! Set just steps from Piazza Walther, the Duomo’s Gothic appearance and tiled rooftop set it immediately apart from the crisp, primarily pastel-colored buildings that surround it. 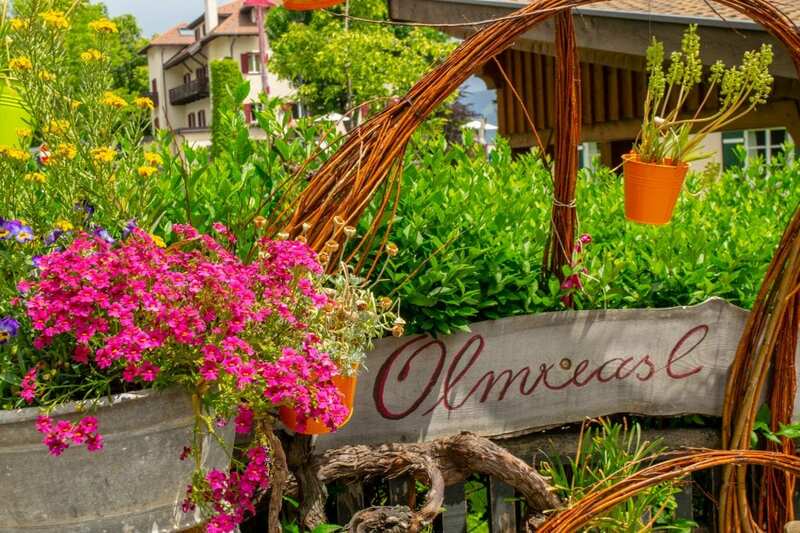 In a more-than-century-long tradition, each spring Piazza Walther finds itself coated in gorgeous flowers and greenery for its annual flower market. 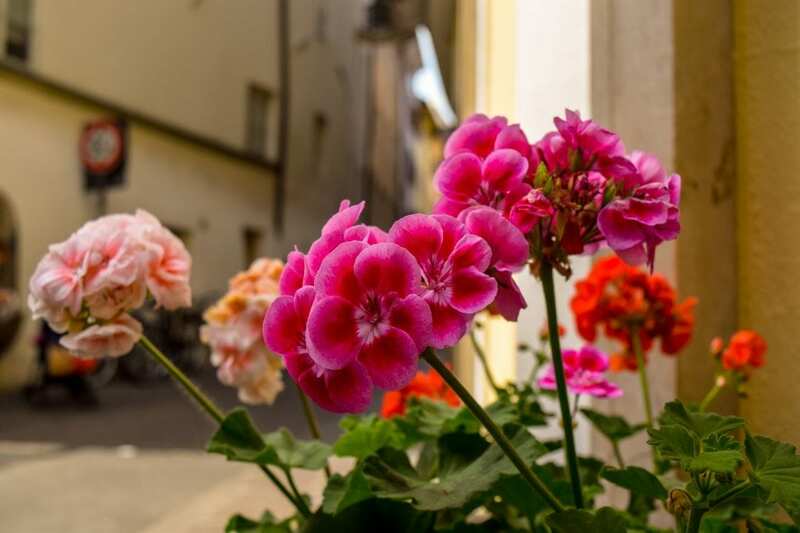 If you happen to be in Bolzano at the right time of year to visit, be sure to stop by for endless photo opportunities and perhaps a bouquet or two! Dive into the cuisine of South Tyrol. 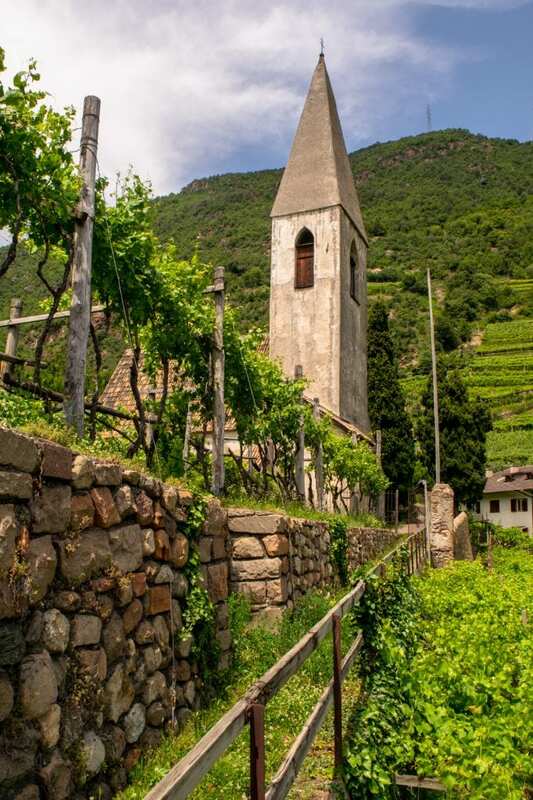 The cuisine of South Tyrol is a delightfully delicious blend of Italian and Germanic influences–you’ll see strudel and speck (local cured ham), dumplings and pasta, wienerschnitzel and wine, polenta and pretzels. When in doubt, order anything sourced locally–local cheeses, wines, and meats are particularly popular and easy to find–and prepare to immediately add a dozen long, lingering meals to your list of things to do in Bolzano. Take a ride on the funiculars. 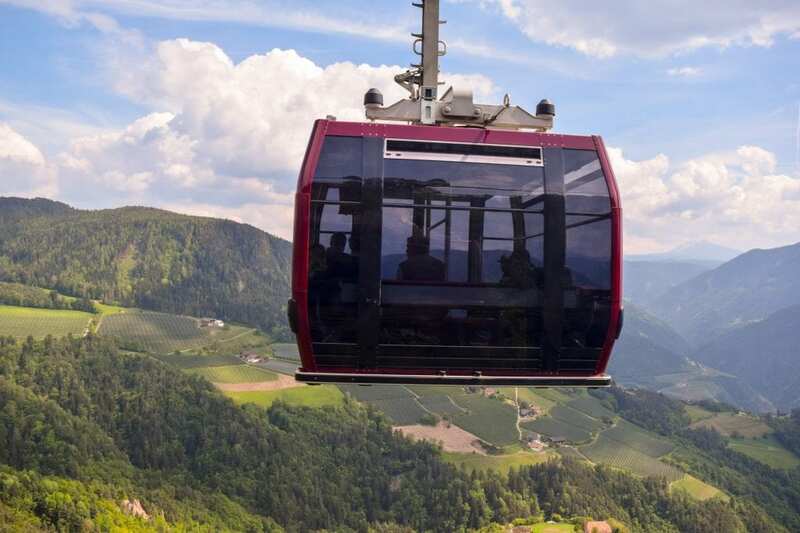 Bolzano is home to three funiculars, and each one stands ready to ferry you off to picturesque villages, great hiking opportunities near Bolzano, and unforgettable views. The most popular one is the funicular heading to Soprabolzano (and since the station is right in the middle of town, you definitely don’t need a car to access it). Once you arrive in adorable Soprabolzano, there is a small train that is waiting to whisk you off to even more villages and views. As if that wasn’t enough, the funiculars themselves are fantastic entertainment and are an amazing way to appreciate the views of the mountains, villages, and vineyards that surround Bolzano. Marvel at the unique culture of South Tyrol. South Tyrol feels like a world between worlds: until 1918, the region was part of the Austro-Hungarian empire, and it has clearly retained aspects of Germanic culture. The architecture often feels more German than Italian, the food obviously has Germanic influences, and in a way that’s difficult to put into words, the area often feels more Germanic than Italian–perhaps it’s the more reserved and formal culture, perhaps it’s the pristine cleanliness of the streets, perhaps it’s something else. You’ll also hear German spoken at least as often as Italian in South Tyrol, particularly in the smaller villages like Soprabolzano. It makes South Tyrol a fascinating environment to explore, and an incredibly rich cultural destination. Check out the daily market at Piazza delle Erbe. 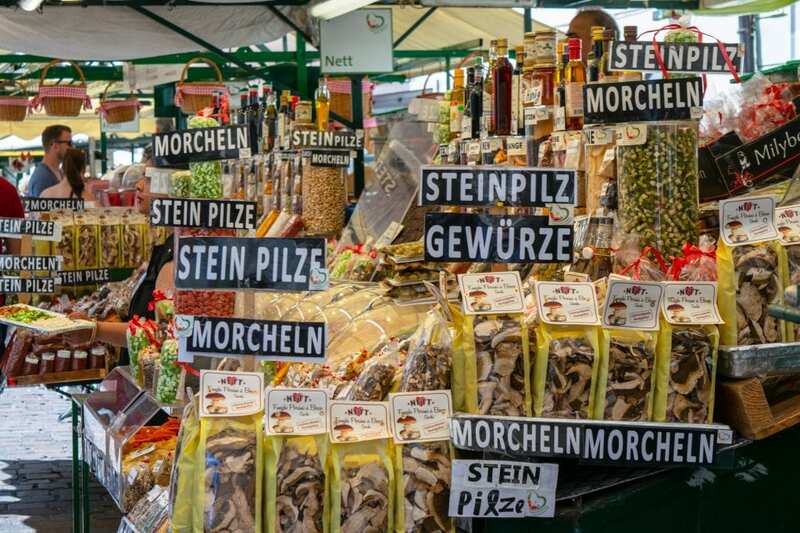 The local market at Piazza delle Erbe is one of my favorite spots in Bolzano–it’s constantly exploding with colorful and tasty products, from sunflowers to speck, and is bustling with activity. A visit here will always be on my list of things to do in Bolzano, no matter how many times we visit! 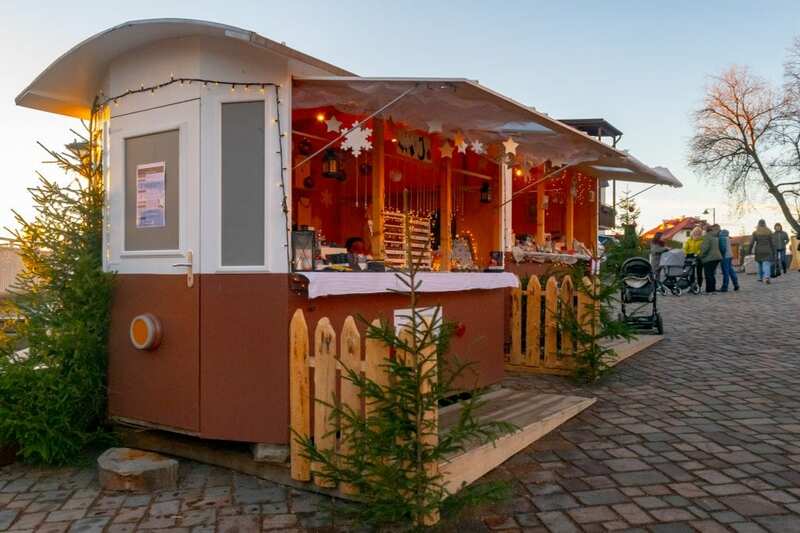 In December, visit the oldest Christmas market in Italy. Bolzano is home to Italy’s oldest Christmas market, and while it doesn’t hold a candle to those in Austria in Germany (sorry, Italy), it’s still pretty fabulous. You’ll find local products and artwork, a mix of food that makes the blend of Italian and Germanic culture in South Tyrol evident, plenty of Christmas trees, festive decor, local wine, and even a small ice skating rink. The city center of Bolzano is easy enough to get around by walking, though distances can be a bit far if you’re staying further from the center (think 30+ minutes of walking in some cases). If you’re wondering how far a particular location is from the city center, check the walking distance to the hotel from Piazza Walther. 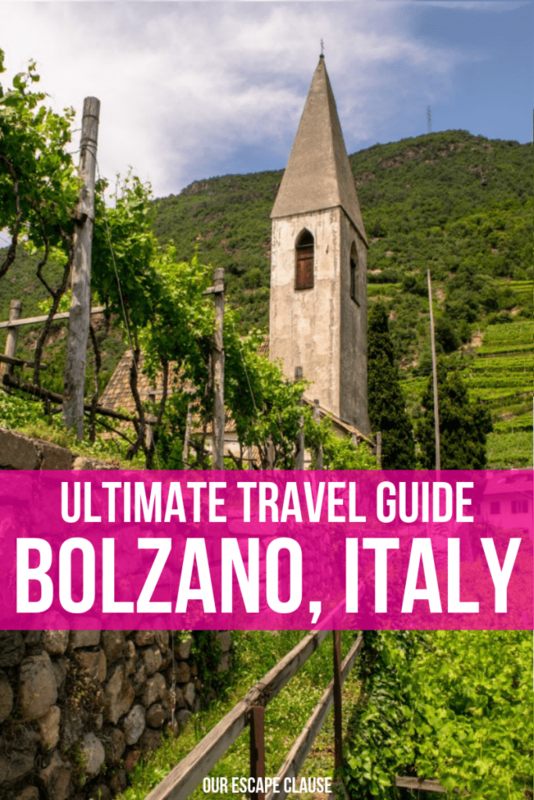 We’ve visited Bolzano both with and without a car, and while having a car does make things a bit simpler and give you more options when you’re considering what to do in Bolzano (especially if you want to stay outside of town or be able to access the Dolomites and hike in gorgeous destinations like Tre Cime di Lavaredo and Seceda), it’s really not necessary. There aren’t any metros in Bolzano, but there is a fairly easy-to-use bus system (though keep in mind that the buses may not always run quite on time). During the high season, there are also tourist shuttles than run out to popular attractions like Castel Roncolo. Capitol Rooms — “Budget” in Bolzano is a bit of a misnomer–we’ve generally found South Tyrol more expensive than most other places in Italy–but if you’re looking for a simple, reliable location in the heart of Bolzano for relatively low prices, Capitol Rooms might be the right option for you! Check rates & book your stay at Capitol Rooms! Art & Design Hotel Napura — If you’d like to trade a close location to the city for beautiful vineyard views, a rooftop hot tub, a hearty breakfast, and spacious, luxurious rooms, consider the Art & Design Hotel Napura. Some of our family stayed here on our latest family trip to Bolzano, and we can attest to the fact that the property is beautiful and the service wonderful! 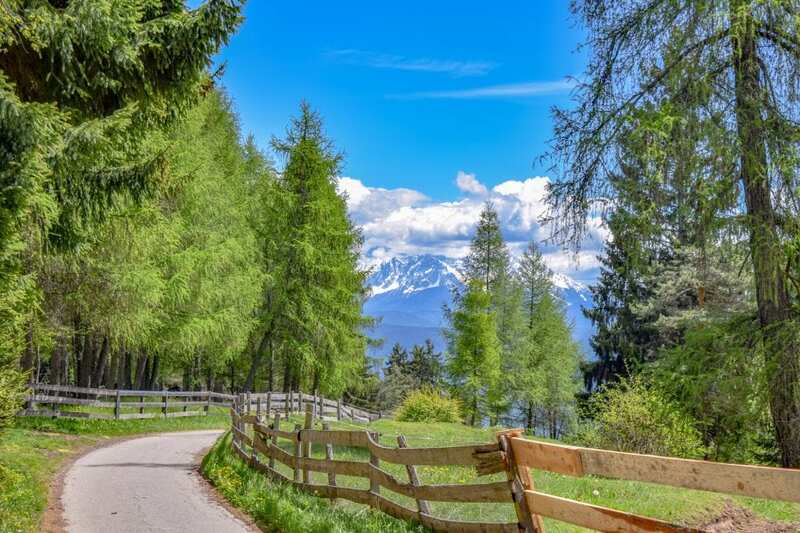 Since the hotel is a few miles outside of Bolzano, you’ll probably want to rent a car if you’re visiting this property–however, it’s not entirely necessary, as there is a local bus stop a short walk away. Check rates & book your stay at Art & Design Hotel Napura! Parkhotel Laurin — Housed in a stunning Art Nouveau building in the center of town and home to a gorgeous restaurant featuring South Tirolian cuisine, Parkhotel Laurin is the perfect place to relax in the lap of luxury in Bolzano. You can’t ask for a prettier property, tastier breakfast, or better location from which to explore the best things to do in Bolzano! Check rates & book your stay at Parkhotel Laurin! thanks guys for ur information, its a good job, its really amazing place. TRAVEL MORE! Thanks, Vanda! 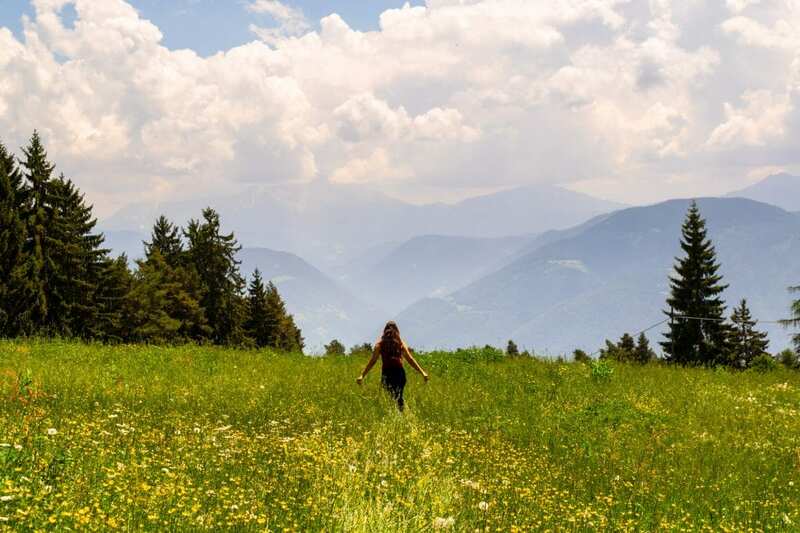 We’ll definitely head back to Bolzano one day–there is a lot more hiking to do! Bolzano looks and sounds fantastic and I think it’s safe to say you’ve convinced me to visit! Marking it on my Google Maps now so I don’t forget! Thanks for sharing your experience and suggestions on things to do. Just wondering what the best way to travel within Bolzano to check out places such as Dolomites, Maranza, Lago di Braies, Santa Maddalena, Val di Funes,	Val Venosta/Vinschgau, Durnholz Valdurna, Ritten/Renon, Durnholzer See and Sarntal. It will be my first time visiting Europe/Italy, so feel very lost. Any help/advice would be highly appreicated. Unfortunately, this trip was in mid-2016, so the exact villages we visited have faded from memory (this was before copious notetaking!). In general, we found the best way to get around to different villages in the region was the funicular (included in the Bolzano card, along with public transportation such as buses), and the train for destinations that were further away. We visited many surrounding villages and towns during our trip, and though we had rental cars, we didn’t once use them. The public transportation system, including the funiculars, was robust and easy to use. Good luck with your trip! It’s a beautiful area, we’re hoping to plan a trip back soon.